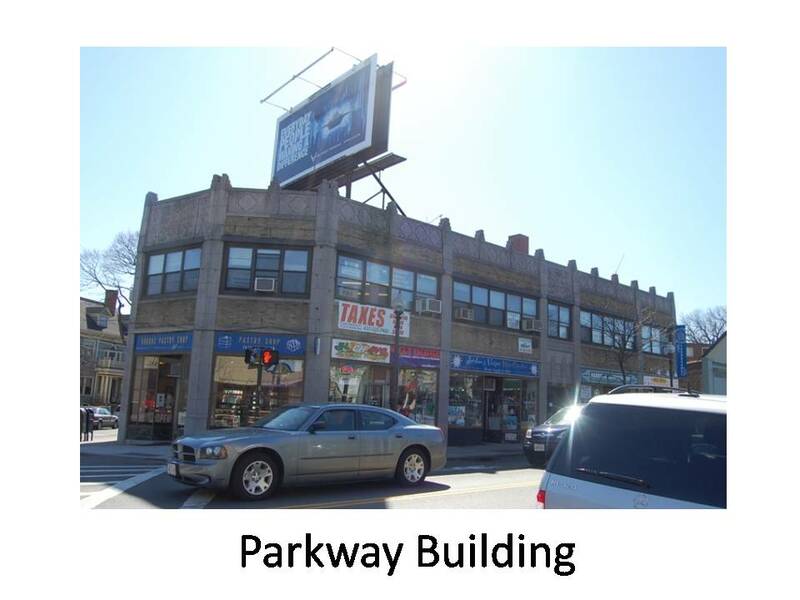 Last week, we shared a few of the buildings that had been selected for HBI's Commercial Casebook in Roslindale Village (the week before, we told you a bit about the history of Roslindale Village). Today we have the balance of the Roslindale Casebook Chapter. 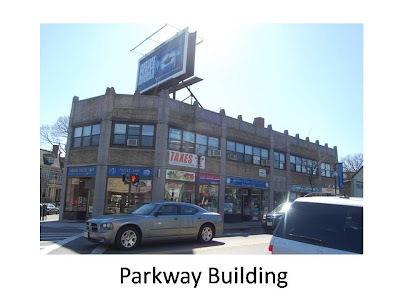 HBI believes that if the following buildings were rehabilitated or rethought, that they could could strengthen the economic viability of the commercial district. Through conversations with neighborhood stakeholders, tours of the district, and a lot of research into the history of Roslindale’s built environment, Historic Boston identified the following properties to list in our Commercial Casebook, along with some information about the buildings’ significance. Parkway Building: The Parkway Building is a two story building located on the corner of Washington and Poplar Streets, with the primary façade facing on Washington Street. The distinctive parapet features decorative panels separated by bold piers topped by ziggurats. Building permits show that the Parkway Building replaced a 1 ½ story wood stable building that was razed after two horses fell through the floor in the middle of the night. The building was developed by John Basile of Basile Realty Company, a local contractor that developed several commercial and residential parcels in Roslindale (including the commercial building at 4196 Washington Street, on the corner of Basile Street). He hired Maurice Levy, a relatively unknown Boston architect who also designed residential homes in Jamaica Plain’s Woodbourne neighborhood. Levy designed an underground extension in the rear to accommodate plans to build bowling alleys in the basement of the building. The first floor has always contained commercial retail uses, such as pizza shops, bakeries and hair salons, while the second floor was used for office space. The attractive Art Deco commercial block is a significant character defining feature for the commercial district. Prescott Building: Located on Poplar Street, facing Adams Park, the Prescott Building is a highly visible building in Roslindale Square. 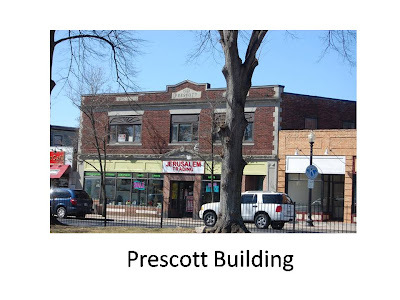 The Prescott Building was built in 1929, during the boom days of Roslindale’s development. The large two story brick commercial building replaced earlier wood frame buildings that stood on Poplar Street. Building records show that a one story wood store building was constructed on this site in 1895. In 1929, Anne Prescott petitioned the city to raze a 1 ½ story building occupied by a store and a dwelling on this location. To design the current building, Prescott hired Harold Duffie, a prolific architect that mostly designed residential homes and was particularly active in the Woodbourne and Forest Hills neighborhood. In the early 1930s, Prescott filed a permit to include an indoor miniature golf course in this building. Other long term uses included Charlestown Savings Bank, a beauty salon on the second floor, and Blair’s Foodland, for which a small 1 story rear addition was built in 1946. The building’s storefront has been altered several times. 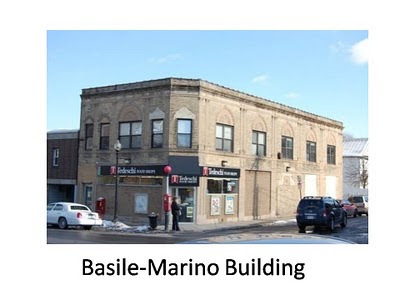 Basile-Marino Building: The Basile-Marino building was constructed during Roslindale’s commercial boom of the late 1920s. The Basile Realty Group was responsible for much of the commercial development in Roslindale during this time. The building, located on the corner of Washington Street and what is now called Basile Street (likely named for the developers), was built to house a showroom. What they were showing is unknown at this point, but the presence of an autobody repair shop at the rear of the building (on the Basile Street side), suggests that the business was showing cars or auto mobile parts. The large show windows on the first floor (now bricked over or otherwise altered) were integral to this original use. Today, the first floor of the building features a Tedeschi’s convenience store and office space on the second floor.